The following interview was originally compiled for the Mixed Migration Review 2018 and has been reproduced here for wider access through this website’s readership. Drones, long floats, and empathy were key to MOAS pioneering efforts to rescue tens of thousands of migrants at sea, explains Regina Catrambone. 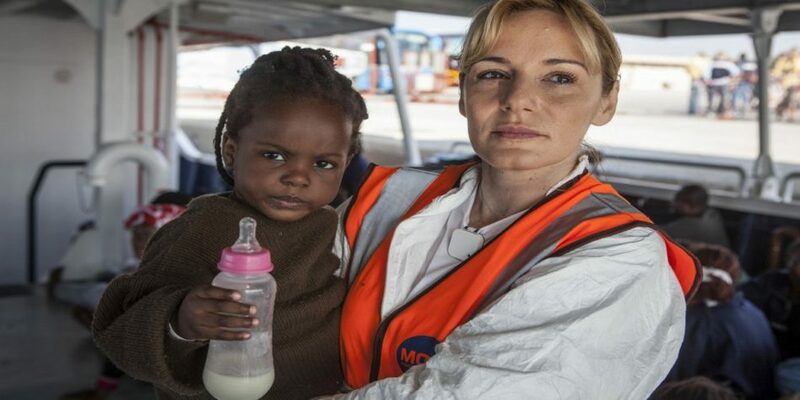 She is an Italian philanthropist and co-founder and director of Migrant Offshore Aid Station (MOAS), a non-governmental organisation set up in 2013 to mitigate the loss of migrants’ lives in the Central Mediterranean and Aegean seas. In your view, what is the primary cause for what is called mixed migration? I would say the main cause is indeed very mixed. Many people are persecuted because of their religion, others run from the effects of war, which is why we have seen so many Syrians over the last years. Climate change, livelihood situations, water and food scarcity also play a major role. We are facing mixed migration, I would say, because of a crisis of humanity. People are suffering from different backgrounds, but they cannot find a solution in their countries of origin or transit, so they are forced to flee and look for a better life. Even we find on the boats teachers, professors, doctors and lawyers. Since MOAS’s first operations in August 2014, it has rescued tens of thousands of maritime refugees and migrants. When you started did you have any idea what you were getting into? Actually, in the first week we didn’t encounter any vessel in distress. In fact, my husband Christopher was calling me saying “we aren’t finding any migrants on the Mediterranean”. And then one day they found a wooden boat. There were many children and it was quite a difficult rescue. When we started MOAS, we saw the problem that many people were dying at sea, so we asked ourselves what we could do, and we decided the first thing is that we need a boat and of course we had to finance it all ourselves, and we did it with our own financial and professional resources. We wanted to shift attention from the ports and raise awareness of what was happening out at sea. In 2014 the Mare Nostrum mission run by the Italian Navy was the only military and humanitarian mission specifically aiming to assist vessels in distress. We felt we had to be there to save humanity, to save our brothers and sisters. It doesn’t matter if they are bad people or good people: everyone who is in distress at sea needs to be rescued. Both at sea and on land we fully cooperated with official authorities, but it was fundamental for us to be along the world’s deadliest migratory route. MOAS was a pioneer in private maritime rescue at that time, but soon other NGOs joined the rescue effort following your lead. Yes, when we started we were alone and we needed to shift the attention from the port to the sea to see the suffering and create empathy. It was one of our goals to bring civil society out there to help because the more boats out in the sea meant higher chances to help people and defend human rights, so we were quite happy to be the pioneers of this movement. Of course in 2015 when we were approached by MSF and others to cooperate we were very honoured. I have a great respect for these organisations and we learnt a lot from joining forces with others for a common, good cause. At that time the only humanitarian mission was Mare Nostrum with military assets for search and rescue. We explained in advance to the Italian Coast Guard what our mission was and we cooperated very closely with them. We always worked with professional staff, not volunteers, and we created the format which other NGOs then replicated in their own way. What MOAS developed was the operational pattern and we also developed new tools for search and rescue, like the long floats for a hundred or more people to hold onto while the rescue took place, when the vessel capsizes during a rescue situation for instance. In fact, we were the first to use drones because we wanted to use the best equipment for search and rescue. We felt they shouldn’t just be used for war: why shouldn’t we use drones conceived for war for a good cause and to rescue human lives? The earlier you arrive the less casualties you will find. Did you come across many bodies in your work? This is a very sensitive question for me, because for me they drowned because of a lack of empathy and response out at sea. In the Mediterranean, smugglers don’t care if the migrants die or live because once they are on the sea they have already collected their payment. There were times when we knew we couldn’t rescue everyone. Sometimes when we arrived, the vessel had already capsized and so first we rescued everyone alive, but then we passed by and collected the corpses. I remember closing up children and pregnant women in body bags, and those images will never leave me. I will always have those memories till I die. When you close a child or a pregnant woman in a body bag, you have the feeling you are burying the entire humankind. Many died inside the boats. We found many corpses inside the boats because they were intoxicated by the fumes, and fell into a deep sleep and then they drowned inside the boat because there is always water at the bottom, normally mixed with fuel, even in the rubber dinghies. The mixture of salt water and fuel is deeply intoxicating and also causes skin burns. These dinghies are sometimes just ten meters long with 150 people [on board] and the people can’t even move to save each other. But the wooden boats were the worst. It was so very sad because I am a mother and I am a wife and it’s very important to talk about the human part of the stories. They are not just numbers. Did the atmosphere and conditions change in the Mediterranean between 2014 and 2017 in terms of the reactions of ports and of those countries where you brought the migrants and refugees whom you had rescued? Yes, of course it did but here I am a bit of a devil’s advocate because at the start we were one boat and things were easier, but when there were many NGOs and many boats and each one had their own modus operandi, it was much harder for the authorities to control. Of course, I was very happy when the other boats came, but I knew they could potentially increase misunderstanding, confusion and lack of communication on both sides. Most probably, this is why the Italian government asked search and rescue NGOs to sign the Code of Conduct. In fact the atmosphere has been deteriorating since late December 2016, then we started to see the criminalization of solidarity, the physical attacks against migrants and other abuse started. Even myself and my husband and our family were exposed to abuse and criticism: they thought there was some hidden, unclear reasons for what we were doing. However, we were pushed by mercy, altruism and brotherhood. Some have accused the rescue missions of making it easier for human smugglers and enabling irregular migration, providing a “taxi service” or even colluding with smugglers. What do you say to these criticisms? MOAS has never been in contact with smugglers. We used to destroy boats after rescues were completed. We were always cooperating with official authorities and shared information and data with them. Anyway, we saw our mission as saving lives, we were not meant to act as police officers. Disembarkation followed the instructions given by the Italian Coast Guard, after notifying the port of safety, so we never acted independently. Despite the fact that MOAS’s work is highly humanitarian in nature, the rescue missions in the Mediterranean were and are part of a very controversial migration debate in Europe with dramatic political outcomes. Has this ever caused you to doubt your work? We didn’t take any independent decisions. We followed SOLAS stipulations. We brought people to Europe because Libya was not a safe place, but it’s true that when the whole scenario dramatically deteriorated, we decided to suspend our SAR mission and redeploy assets where needed in Southeast Asia. We were the first organisation to sign the Code of Conduct. We had no problem with it at all, but if you are there to defend people, their human rights, protecting them from torture and abuse, and then you have to bring them back to a place where they have been tortured and abused, well, that was unacceptable. I went to Rome myself and spoke to the vice minister of foreign affairs and vice minister of the interior and informed them that we felt we had to stop our mission. They were quite sad, but after I explained our reasons they understood. In a nutshell, MOAS didn’t want to become part of a mechanism aimed to reduce the number of landings without considering the fate of the people brought back to Libya. After September 2017, MOAS headed for the Andaman Sea. How did you find working there? It was not the same in Andaman sea, but the main problem in Asia is that we faced a lot of intimidation and obstruction, with bureaucracy and high port fees and unusual limitations. It was indirect intimidation. In fact, the Thai authorities followed us by boat and even by helicopter at times. I think the number of boats being reported as leaving in the Andaman sea is very low, but it is just the tip of the iceberg. They are leaving in small boats and there are many of them. Even when we first arrived near the beaches around Cox’s Bazar, in Bangladesh, in the end of September  we saw seven to ten bodies of Rohingya children washed ashore. We don’t know how many boats are leaving, but even though we did not find many situations, we were also there to raise awareness. The official fatality rate is very low, 1.2 percent, but the fact is that nobody really knows how many boats depart, how many people attempt the crossing, and how many reach safety or drown. In fact, when we had communication with some of the larger institutions like the UNHCR they asked if we had permission from the government to be in the Andaman Sea. We disagreed with them. Why do we need permission from the governments? We were in international waters, and only there to help people and monitor the situation. Just looking at the situation there: More than 750,000 refugees who fear to return to Myanmar, living in very poor conditions. Do you think the Andaman Sea is going to be the scene of large scale maritime migration again in the future? Yes, absolutely. And I would stress this because it’s not just the Rohingya but also the local population, the Bangladeshis who are competing for crumbs, and the conditions for both groups are appalling. MOAS was created to mitigate the loss of life at sea, but our main mission is to keep hope alive and assist the world’s most vulnerable migrant and refugee communities. Bangladeshis are coming to Europe and Italy too because they lack good job opportunities and decent living conditions. You have been running MOAS for four years now. You were not previously an aid activist. How would you say this work has changed your perspective? To tell you the truth I love business and I am still involved in the corporation we created, as well as the fact that I still need a salary to pay the bills because my work with MOAS is entirely voluntary. Actually, I think entrepreneurs should be much more involved in humanitarian work. They come with a different perspective and have talent, know-how and expertise to offer. I really believe in the power of entrepreneurs for the cause of good. But there is still so much to do. As MOAS’ co-founder and director, I am happy and proud that we could rescue and assist more than 120,000 people, around (40,000 at sea and more than 80,000 in Bangladesh). Between 2014-2017, MOAS search and rescue missions rescued and assisted more than 40,000 children, women and men. Since September 2017, MOAS has been working in Bangladesh, where it opened two primary health centres to provide life-saving medical care and humanitarian assistance to Rohingya refugees and local host communities. The Rohingya community is considered the world’s most persecuted minority. In August 2017, it was the main target of a new wave of violence in Myanmar, one that pushed more than 700,000 people to seek sanctuary in Bangladesh and triggered the world’s fastest-growing refugee and humanitarian crisis. In July 2017, Italy asked all NGOs working from its ports to rescue migrants at sea to sign a restrictive Code of Conduct. Many refused, and the move has reportedly led to almost no rescue boats operating in the Mediterranean by mid-2018. The International Convention for the Safety of Life at Sea (SOLAS) sets minimum safety standards in the construction, equipment and operation of merchant ships. Chapter V of SOLAS (Safety of Navigation) obligates masters to provide assistance to any person in distress at sea, regardless of nationality or status of that person, and mandates contracting governments to co-ordinate and co-operate in assisting the ship’s master to deliver persons rescued at sea to a place of safety.